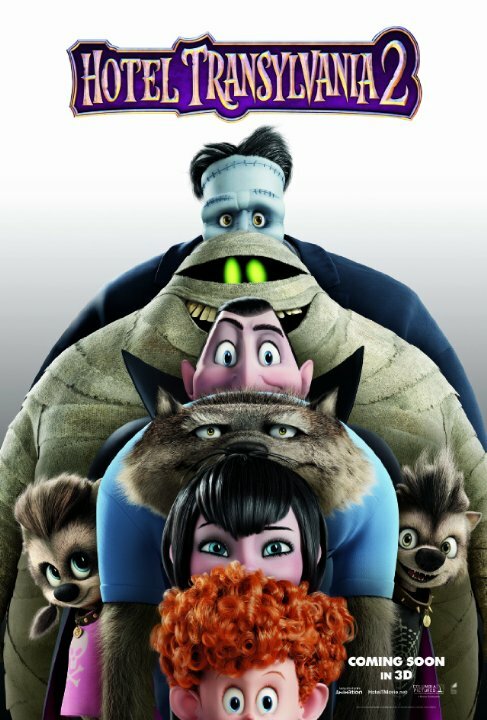 Mavis and Johnny, the star-crossed couple from the original HOTEL TRANSYLVANIA, are now married and starting a family in HOTEL TRANSYLVANIA 2. Dracula (voiced by Adam Sandler) is thrilled to be a “grampire”, but is starting to become a little concerned that his grandson Dennis (voiced by Asher Blinkoff) hasn’t displayed any vampiric traits yet. He’s almost five, and if his fangs don’t pop out by that particular birthday, they aren’t going to. Meanwhile, Mavis (voiced by Selena Gomez) is flipping out over all the dangers to a human baby living in a hotel built for and populated by well-meaning but still potentially hazardous monsters, and is considering moving to California near Johnny’s family. Johnny (voiced by Andy Samberg), on the other hand, actually wants to stay at the hotel, which he is converting to accommodate humans as well as monsters. Of course, if you saw the first HOTEL TRANSYLVANIA, you’ll remember Drac was not above using fabrication to get his daughter to do what he wants, and this being a typically lazy sequel, the plot once again hinges on his ever escalating deceptions. Drac happily agrees to babysit as Johnny (who is in cahoots with Drac) and Mavis go to visit Johnny’s folks and scout for a potential new home. That way he can step up his efforts to speed up little Dennis’ transformation into a monster with the help, of course, of his monster buddies Frank (Kevin James), Wayne the werewolf (Steve Buscemi), Murray the Mummy (Keegan-Michael Key), and the Invisible Man (David Spade). No real shocker how that turns out. And there’s also a subplot about Dracula’s father, Vlad (Mel Brooks), not being able to accept humans that feels like pure padding. HOTEL TRANSYLVANIA 2 isn’t awful, but it’s nothing to write home about, either. The same can pretty much be said of the first film, but at least that one had the benefit of coming across as a somewhat fresh concept. This is mostly just a lazy recycling job of ideas from that first film, combined with a generic “we can’t think of anything else so let’s have the characters become parents” plot used by countless other desperate sequels with no reason to exist. At this point no one expects much out of Sandler, who co-wrote the screenplay with Robert Smigel, but director Gendy Tartakovsky is responsible for some of the best animated kids shows of recent years (Dexter’s Laboratory, The Powerpuff Girls, Samurai Jack). Here he’s just a hired hand bringing Sandler’s pedestrian ideas to animated life instead of his own creations. As for Smigel, he’s the SNL writer responsible for that show’s TV Funhouse segments, and the creator and voice of Triumph, the insult comic dog, all funny stuff. Every once in a while there’s a joke or visual gag that reminds you of that, but not many. Kids will probably be satisfied if they liked the first one - my 4 year old certainly enjoyed it - but this is really the kind of mediocre product that should have gone straight to video. 2 out of 4 stars.